Daily Debate: What is the Worst Food Buff in Breath of the Wild? Throughout his adventures in Breath of the Wild, Link can gather up cooking materials and prepare various meals and dishes. As a welcome addition to the game’s open-world design, this cooking mechanic allowed the player to explore the world for ingredients, experiment with many culinary combinations, and whip up meals as preparation for any situation. Each successful dish has its own useful properties, but there are certainly some food effects that are better than others. 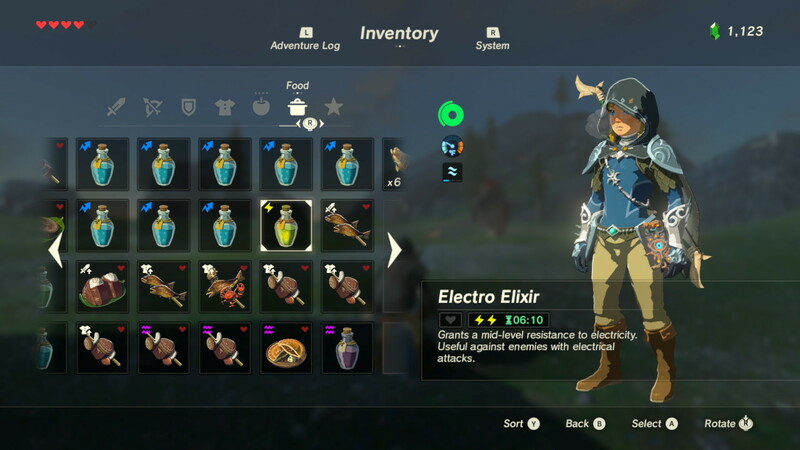 Besides replenishing hearts, the dishes of Breath of the Wild can offer one of the following temporary effects: Hearty (which increases Link’s maximum life bar), Energizing (which replenishes stamina), Enduring (which increases Link’s maximum stamina meter), Hasty (which increases movement speed), Fireproof (which prevents Link from catching fire), Spicy (which raises body temperature), Electro (which grants electricity resistance), Mighty (which increases attack power), Tough (which increases defense), Sneaky (which increases stealth), and Chilly (which lowers body temperature). Each of these effects has its uses for sure, but some are worse than all the others. I personally found very little use for the Enduring effect. Even in the early stages of my adventure, I rarely had issues climbing large cliff sides and structures. If my stamina was low, I simply ate a bunch of Energizing foods and continued on my way. Ingredients that granted the Energizing buff were far more common than the ones that granted Enduring, so I always had a stockpile of stamina replenishing dishes at the ready. Adding to my maximum stamina meter never seemed necessary. But what about you? Did you find a food buff that you rarely used? Was there one you think should have been cut from Breath of the Wild? Let us know in the comments below.